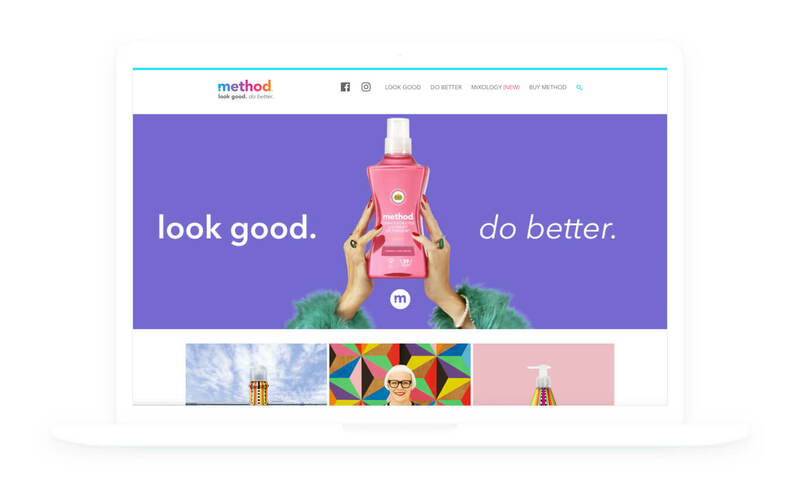 The brainchild of two friends who wanted to create nontoxic, biodegradable natural cleaning products that still look and smell good, Method Products was born in 2000, quickly expanding to the UK and Canada in 2005. In 2012, Method Products joined the Ecover Group, a global organisation focused on sustainability. Ecover and Method Products now form the world’s largest green cleaning products company by sales. As a fellow B Corporation, we closely identify with method’s Business for Good ethos, which is aligned with our own commitment to having a positive impact on the world. 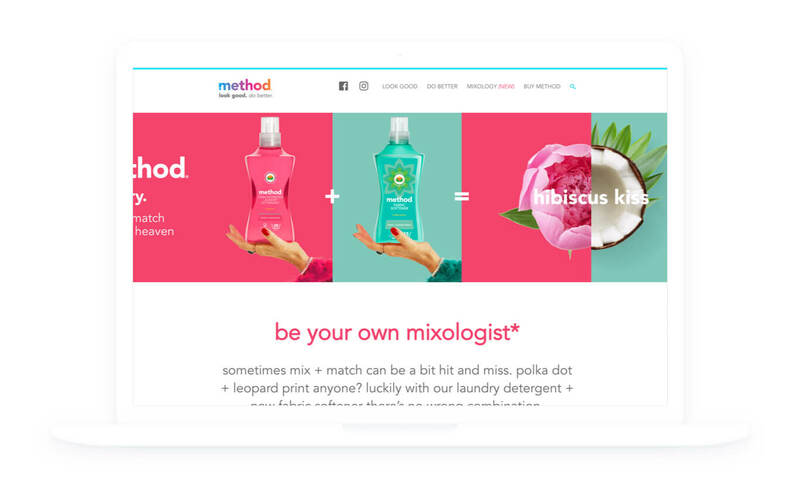 Our relationship with method began in 2014, when they were just expanding into Europe and needed new websites for each country. Although they did have a theme for their USA website, this wasn’t compatible with a multisite installation so they couldn’t replicate it for Europe. With a fixed deadline looming, they reached out to us for a speedy solution. By converting their provided theme into a multi-user installation and adding the WordPress multilingual plugin (WPML), we were able to launch their site in record time, and well within their deadline. Since our initial introduction, helping method launch into Europe, we have partnered on several exciting projects. 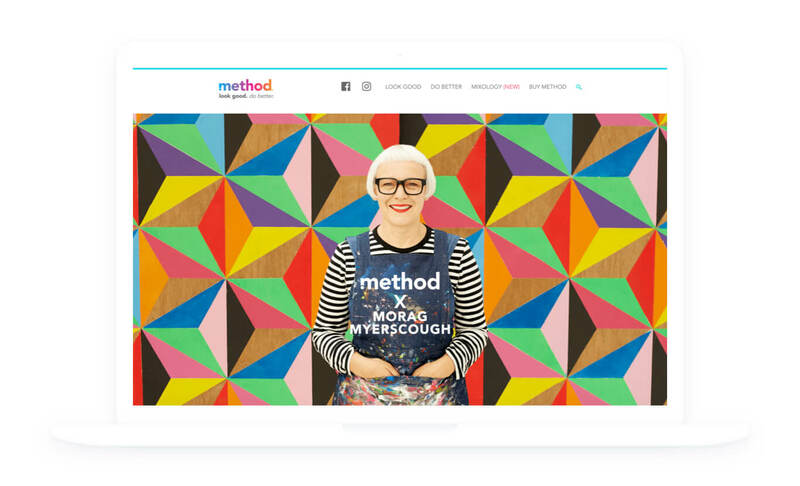 As well as providing ongoing support and maintenance for all of method’s european sites, we have also re-designed and updated the the method website on a regular basis to support various collaborations and new product launches, all detailed below. We really love creating designs that showcase method’s gorgeous eco-friendly products that look and smell delicious and, importantly, actually work (yes, we do use them!). 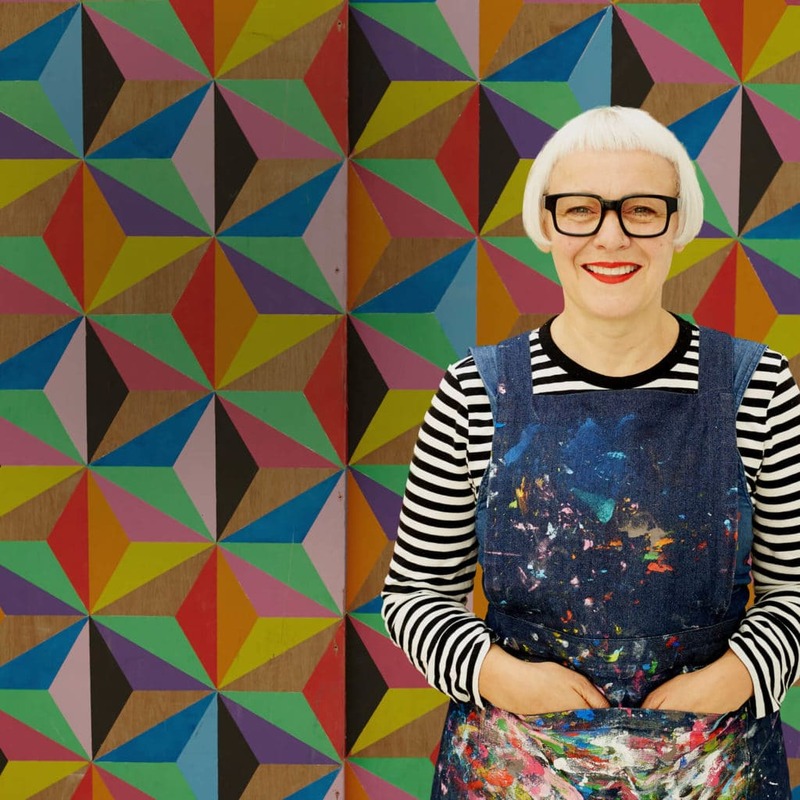 We created a dedicated page for method’s 2019 collaboration with Morag Myerscough, a designer and artist who is well known for big installations, which include several social projects in hospitals and schools. Morag’s collaboration with method was on a much smaller scale, with the intention being to bring a little joy to everyday life. 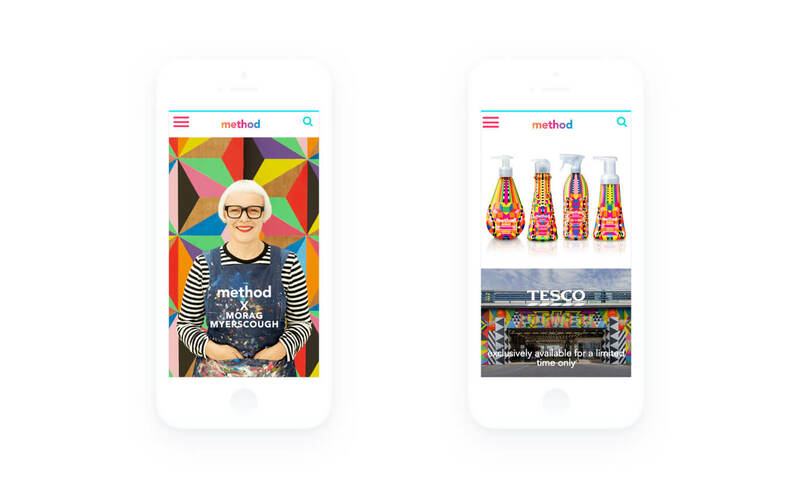 Morag’s bold designs are a perfect match for method’s limited edition watermelon scent range and the website design for this page reflected Morag’s work. As an engaging introduction to this collaboration, a video of Morag sharing her thoughts on the project takes centre stage. The product images animate on hover, and clicking on them takes the user to the method shop to make a purchase. We also added a clear call to action at the end of the page, reminding people that this is a limited edition design, and taking them through to the chosen retailer where they can purchase a range of limited edition method products. 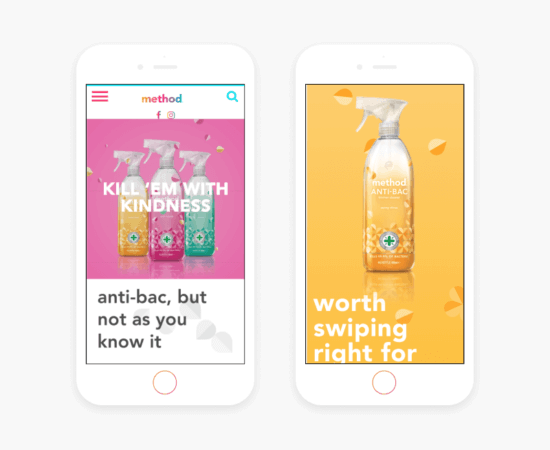 Following the launch of method’s ‘Look Good, Do Better’ campaign in 2018, which focuses equally on the products and the eco-credentials of those who use them, we created a brand new ‘Mixology’ page for method’s laundry range to highlight their newly launched fabric softener. 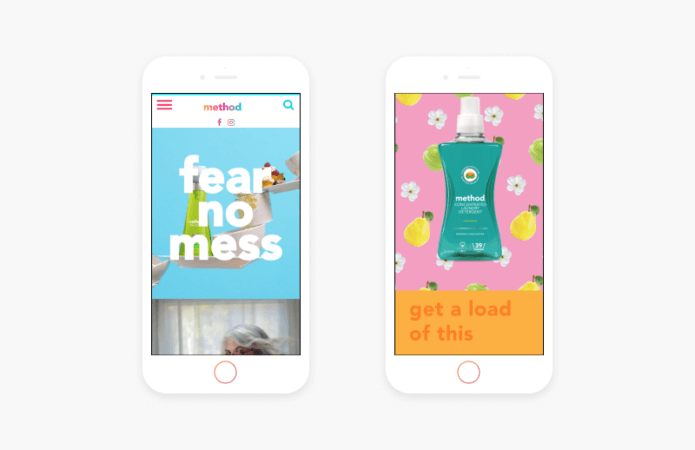 Taking inspiration from the product design and, as always, keeping the focus on method’s products, we created a dedicated page, which highlighted how this new range of fabric softeners can be mixed and matched with the existing laundry detergents. We kept the design simple, with fresh natural images and the eye-catching colour palette recognisable as part of the method brand. This dedicated page features the entire range, with images that change on hover from the product to the natural image that represents it. Clicking on the image takes the user through to the shop to purchase their preferred ‘mixology’ combination. 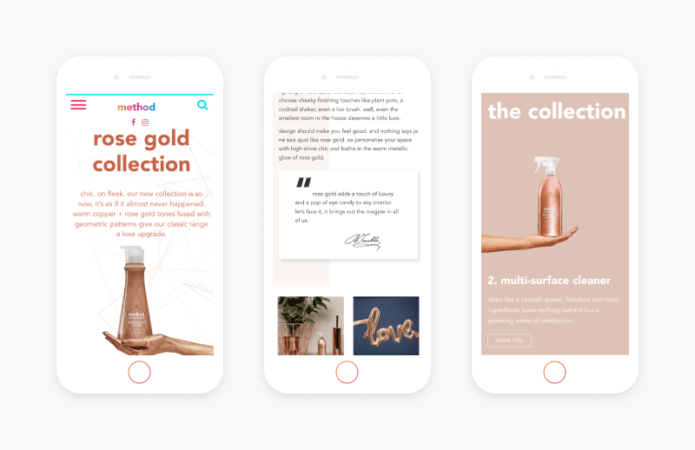 In 2018, we created a page for the limited edition Rose Gold collection, which raised the status of household cleaning products to gorgeous household accessories. Designed to complement the ‘hot’ materials of the year, the Rose Gold collection represented a touch of luxury with a practical application. And, of course, it had the naturally derived, gorgeous smelling ingredients that method customers know and love. For this campaign we kept the design simple, extending the stunning design of this range to the website page. We added subtle animation to the homepage, ensuring that focus is on the product design. 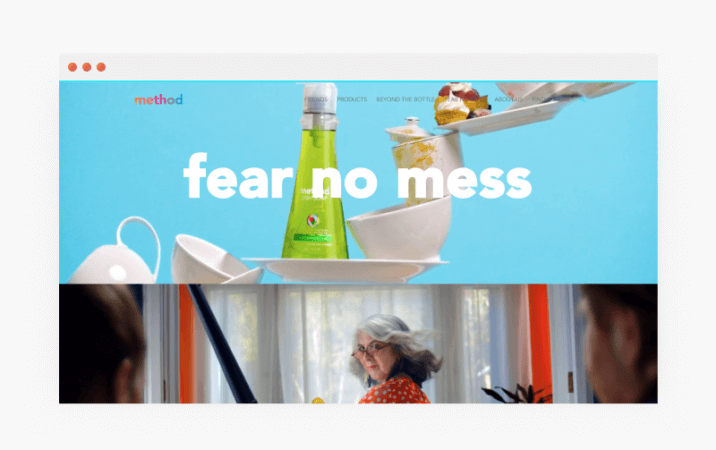 This project was for method’s #fearnomess campaign, highlighting their grease-shifting dish soap and new concentrated laundry range. The laundry range was created with method’s trademarked smartclean technology® – five naturally derived powerful enzymes that tackle dirt and make for a powerful stain remover. We had fun with this campaign, with videos the focus on the homepage, highlighting how well the products tackle everyday messes with ease, in a lighthearted way. For the laundry range, we took design inspiration from the natural ingredients and added some fun animations, making the products the focus with the bold use of colour. 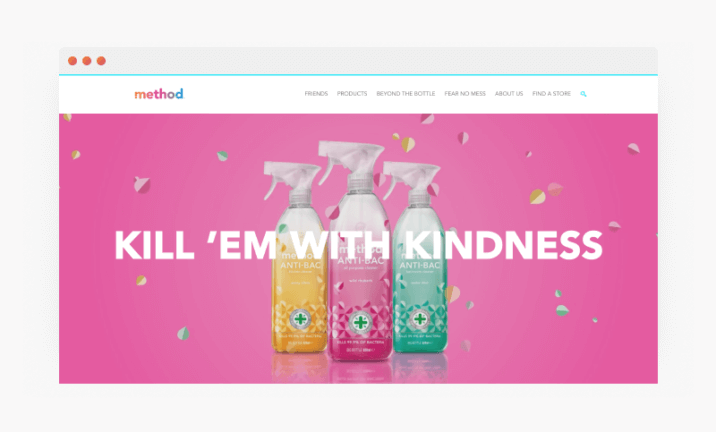 We created a new page for method to promote the launch of their new anti-bacterial cleaning range. Made with naturally derived lactic acid, this range kils 99% of bacteria but, like the rest of method’s products, still smells good enough to eat! 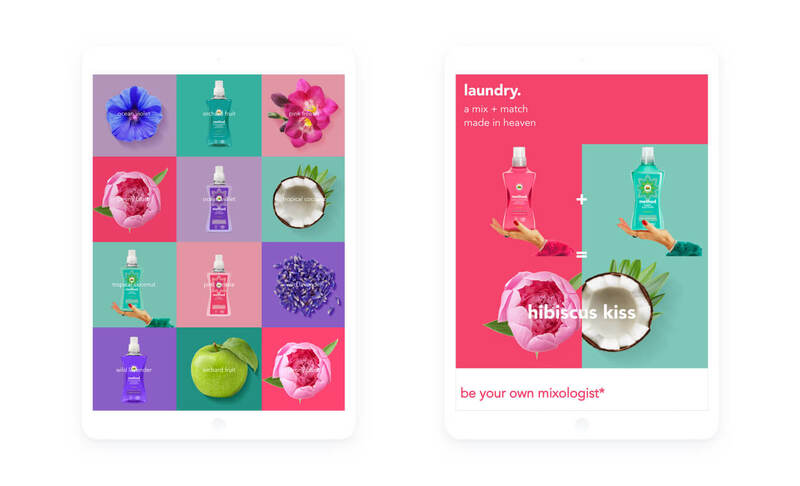 Our designs for this campaign built on the design of the range, and focused on the naturally pleasant aroma of the new products, with added custom animations to highlight the the natural ingredients. 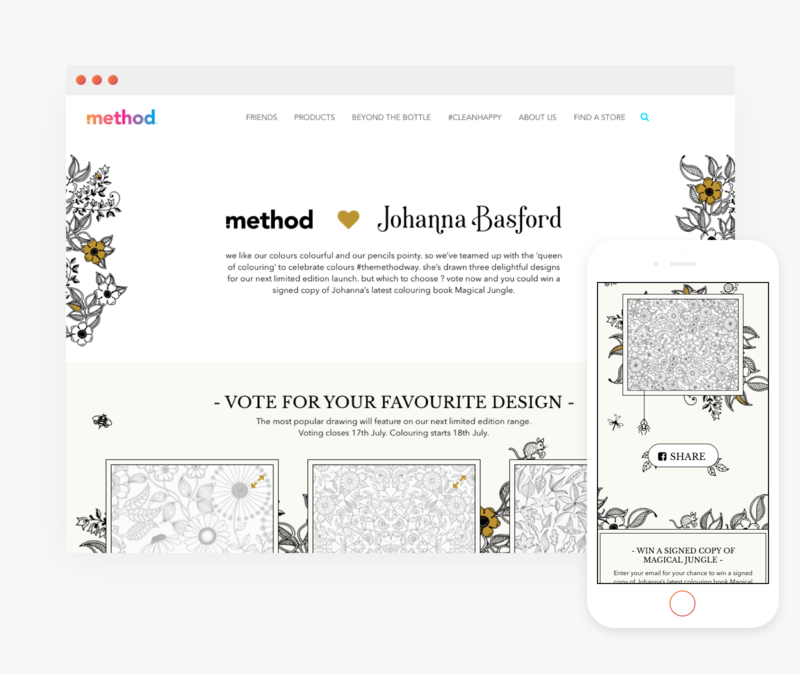 Johanna Basford, the ‘queen of colouring’ worked with method, celebrating colours the #themethodway. She drew three delightful designs for a limited edition launch and we created a campaign page, where fans were able to vote for their favourite design. The winning design (Hummingbird Garden) was chosen after about 10,000 votes. This three stage campaign, the voting stage, announcing the results, and launching the product had a continuously developing design and layout, resulting in a rich, custom campaign with high engagement.